Superbods Jessy Mendiola and Elmo Magalona, two of the country’s hottest young stars, will be joining the 26 Superbods finalists in the Century Tuna Superbods Nation 2016 Pre-Finals Weekend happening on April 2 and 3, 2016, at the BGC Ampitheater, Bonifacio Global City. The event, which is staged in the run up to the Century Tuna Superbods Nation 2016 finals night, aims to reach out and engage with consumers to encourage them to be fab and fit men and women—just like the Superbods! Watch out as Jessy Mendiola joins Chef Nadine Tengco in a delicious cook-out session on April 2, 2016, while the team of Coach Jim Saret will take charge of an intense yet fun Fitness Session also on the same day. Other activities to look forward to is the Circuit Training Session, the Yoga session with Bubbles Paraiso, a Hip Hop dance class with the G-Force and Elmo Magalona, and the meet & greet with 26 Superbods finalists. Join this April 2 and 3 at the BGC Amphitheater to meet and greet your favorite Superbods finalists, and participate in different health and fitness activities. They’ll also be raffling off tickets to the Superbods Nation Finals Night happening on April 10, 2016. Simply download the Superbods Nation 2016 app for FREE! You may also sign-up for the workshops and sessions on-site. There are limited slots and giveaways so better be at the venue bright and early! 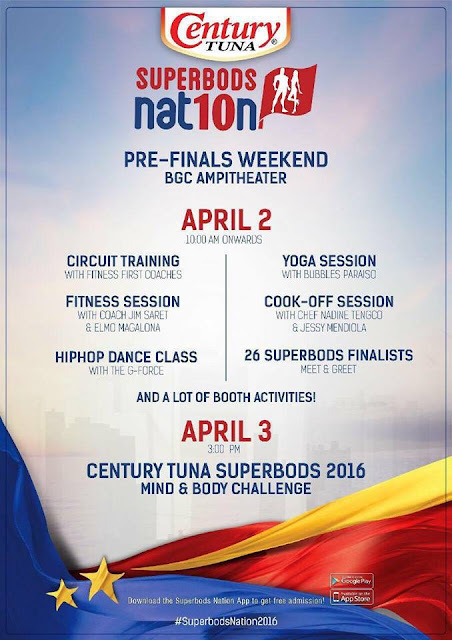 See you all at the Century Tuna Superbods Nation 2016 Pre-Finals Weekend!